Michael McFadyen's Scuba Diving - Patrol Boat 34 The IJN Susuki (also spelt Sutsuki) was a Momi class destroyer built in 1921 by Ishikawajima Zoensho at Tokyo. She was 84 metres long and displaced 935 tons. Powered by two direct drive turbine engines of 12,000 ship driving twin props, the ship was capable of 36 knots. In 1939 she was modified and then retitled as a special patrol boat. Major modifications included removing one boiler (reducing speed to 18 knots). At the same time the Susuki was also renamed to Patrol Boat 34. Just prior to the start of the Pacific War, she was further modified by the removal of one funnel and the rear torpedo tubes. As well, the stern was altered to enable a Daihatsu landing craft to be pulled up on the deck. One gun was removed and the number of depth charges decreased to 18. On 6 March 1943, Patrol Boat 34 collided with the destroyer IJN Yakaze at Kavieng in New Guinea and was badly damaged. It would appear that the entire bow and a fair section of the hull was either totally cut off in the accident or so badly damaged that it had to be removed later. The bridge may also have been removed in this incident. The boat was then towed to Chuuk Lagoon for repairs. The bow of the ship was removed and a new, definitely non-maritime architect designed bow installed (see later). The ship sank on 3 July 1944 but it is not known how this happened, although Klaus Lindemann in his guide Hailstorm - The Dive Guide says that it was hit by bombs from a high altiitude attack. Presumably these plans were North American B-24 Mitchell light bombers from the Solomon Islands (probably Henderson Airfield on Guadalcanal - now what Honiara International Airport). It seems to have had a major fire around this time. The guns were removed, perhaps when it first arrived in Chuuk. The ship is now found a few hundred metres from the western shore of Dublon Island. It has a slight list to port and the bow is only a few metres below the surface. The sand under the stern is about 15 metres. This ship is normally done as a snorkel by Blue Lagoon Dive Shop after the first dive of the day. I also did the wreck as a night dive when I stayed on the SS Thorfinn. 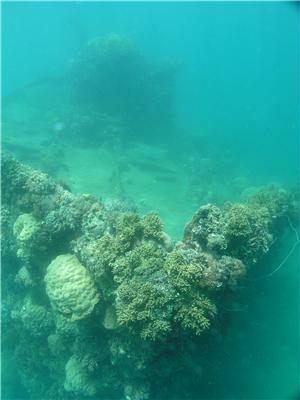 It is not worth giving up a dive on one of the major wrecks in Chuuk Lagoon but as a snorkel, it is very interesting. If you are on one of the liveaboards and want a different night dive from the normal ones. The first thing you notice as you swim over the wreck is the modified bow. It is very poorly done and consists of straight plates of steel welded onto the hull giving a very blunt "pointy end" as distinct from the original very sharp bow. As you swim towards the stern, you see the main superstructure which is also very badly damaged. As I mentioned earlier, I suspect that the bridge may have been removed when the bow was damaged. The remaining funnel (out of the two originally on the ship) has fallen over and is adjacent to the wreck. This is above the engine room. There is a relatively flat and cleared area behind the engine room. The main gun was at the stern end of this section, located on a mounting that stood up above the main deck. You can see this location. Behind here is the stern where you will see the sloping deck that drops right down level to the waterline. Just before the actual stern, there are a couple of depth charges. The sloping stern is so the landing craft could be more easily pulled about the destroyer. If you are diving, you can drop below the stern and see the props. You can enter the hull in a number of locations and explore its somewhat compact interior. The forward section can be entered via many holes in the hull and deck. The rear section can be entered via a manhole on the deck. The engine room is particularly interesting and can be entered via the skylights. An interesting snorkel, a good night dive, but not good enough to give up a dive on the other wrecks in Chuuk Lagoon.